Fraser Burnett, 17 with his Lab Millie at the damaged area in Sandy Park. Police are investigating a series of reports of anti-social behaviour by youths across Broughty Ferry and Monifieth. Residents have reported issues including fire-raising, noise, threats and vandalism of cars and homes. One young mother, who asked not to be named for fear of further intimidation, described how around 15 teenagers shouted and swore at her terrified nine-year-old son on Friday night. The mum, from Ashludie Grange, said: “It’s been happening in the Monifieth area for months, it’s a group of kids around 15 of them, aged from 14 to 17, boys and girls. “They wander around the streets chapping doors, intimidating people, shouting, swearing, throwing rubbish into people’s gardens and they egged a load of houses including ours in December. “All the baby trees that planted and lined the road into Monifieth from the McDonald’s circle were pulled out of the soil and left lying. “My nine-year-old was watching TV on Friday night and they were outside my house screaming and shouting so he opened the window to see what was going on and they started shouting threats and swearing at him. 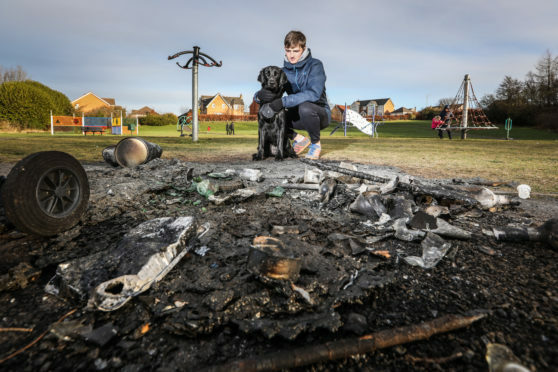 Meanwhile, a number of people living beside Sandy Park in Broughty Ferry were woken up at 1.30am on Sunday by loud bangs and the sight of bins being set on fire in the play area. Fraser Burnett, 17, who often walks his dog in the area, said: “A few years ago we all helped raise money to buy new equipment for the play park and things were looking good for a while. Councillor Kevin Cordell, Dundee’s neighbourhood services convener, added: “I saw the damage and it is very disappointing. Broken glass, the charred remains of the bin and various other rubbish still remained on the scene on Monday afternoon. A police spokesman said: “Police Scotland is investigating a fire raising at the small play park known as Sandy Park, East Balgillo Road, Broughty Ferry, which happened about 1.30am on Sunday. Regarding the Monifieth disturbances, the spokesman added: “Police Scotland is investigating a vandalism to a fence in James Herald Terrace, Monifieth, which happened about 7.20pm on Friday, January 25. Anyone with information is being urged to call 101.